Feed My Starving Children partners with organizations around the world to reach God's neediest children. We donate meals to an exceptional network of missions and humanitarian organizations who work hard to get life-saving nutrition into the hands and tummies of those who need it most. By God’s grace more than 99% of FMSC meals have safely reached their intended destination. Our partners are real heroes. Every day they distribute FMSC food in schools, orphanages, medical clinics and feeding programs in 70 countries around the world to break the cycle of poverty. FMSC meals are not just a donation. Our partners are part of the process to ensure the meals reach their destinations. Partners invest in FMSC meals by paying shipping costs. They help get FMSC meals through customs and across borders, from the U.S. to their final destination. They must verify every box of FMSC food has arrived to their ministry location safely. 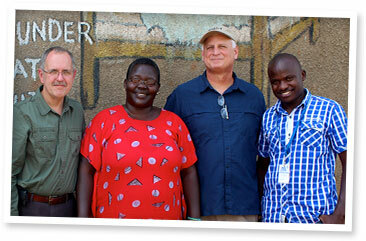 They send reports to FMSC about how our food is impacting the lives of those they serve. Because FMSC meals are donated free of cost, our partners are able to focus the majority of their time and resources on their primary ministries, such as schools, churches/places of worship, feeding programs and community centers, orphanages, health clinics and home construction. The money they would have spent on food can now be used to expand their ministries, pay staff salaries, hire teachers, buy equipment or vehicles, purchase medical supplies and so much more. Final destinations are subject to change due to variabilities in international shipping. "Our partners have the heart of a pastor, head of an entrepreneur and guts of a marine."